Home › General › What is the Gospel? Have you ever had the experience of thinking you knew what a word meant, until someone asked you to define it? All of a sudden something you thought was clear and obvious turned out to be quite challenging to explain to someone else. It’s a deceptively simple question, but our professor really kicked our critical-thinking skills into high gear. Any answer we proposed was tested against Scripture and given a slew of follow-up questions. Through this process, he proved to us the truth that when our explanations are unclear, it can mean our understanding is fuzzy at best or actually a misunderstanding at worst! The gospel is often one of those things we think we understand. But if I asked you to explain what “the gospel” is, what would you say? And more importantly, would it match what Scripture says? Well, that is true, and it is part of the gospel. But it’s not the whole story. There is more to it. #1: It makes the gospel “me-centered,” leaving out the fact that the gospel is good news for not just individuals, but communities and even the whole of creation! #2: It makes the gospel nothing more than a “get-out-of-hell-free” transaction. Then the response we expect is a transactional one: Sign the dotted line; believe this one fact; pray this one prayer — and then you’re good to go! Why bother with discipleship or a changed life or church involvement? #3: It doesn’t do justice to the biblical picture of the gospel. When Jesus and the apostles described the content of the gospel, it involved much more than just the atonement or justification by faith (though those are certainly included!). Plus, if all the gospel entailed was, “You sinned; Jesus died for your sins; believe in him and you’ll go to heaven,” then why do we need anything between Genesis 3 and Jesus’ crucifixion? What purpose did the entire history of Israel in the Old Testament serve? We need to keep in mind that while justification by God’s grace through faith in Jesus’ atoning death is 100% true and important, it is not the content of the gospel. Rather, it is what happens when we respond rightly to the gospel. Justification is an effect of the gospel. And there are other effects that are just as important (like the indwelling of the Holy Spirit, and release from the powers of sin and darkness, and incorporation into the body of Christ, etc.). So then, what is the gospel? Notice how much historical detail is in this description! Paul spends a lot of time talking about witnesses to Jesus’ resurrection. He mentions that Jesus died for our sins (there’s that part we talked about), but then he goes on to talk about the historical facts of Jesus’ burial and resurrection to glory. And more than once Paul stresses that all of this happened “according to the Scriptures” (talking about the Old Testament). The biblical story of Israel and the promises God made to them were being fulfilled in Jesus! Putting all this together: For Paul, the gospel was first and foremost an announcement of the historical events involving Jesus of Nazareth. And these weren’t just any events, happening to any ol’ person. No, this was the news that Jesus had fulfilled God’s plan and become the long-awaited King. This makes sense when we consider the original meaning of the word “gospel.” The Greek word translated “gospel” (euangelion) literally means “good news.” It was a report of events; an announcement that something important and exciting had happened. For the earliest Christ-followers to proclaim a “gospel” about Jesus the “Christ” (a title that meant “anointed king”) was a very politically-subversive message. They were announcing the reign of someone other than the Roman emperor. And that’s exactly what Paul was proclaiming: that Jesus, through his life, death, and resurrection, had become the promised King (the “Christ”) that the Hebrew Scriptures were expecting. A few verses later, in Romans 1:16, Paul says that the gospel “is the power of God for salvation to everyone who believes.” But since he’s already introduced the basic content of the gospel in verses 1-6, here he’s explaining its effect — that is, what the gospel accomplishes (and therefore why he’s not ashamed of it). The gospel is good news because it is a saving story. The reason all of this is so vital, so crucial when it comes to explaining the gospel, is because it means Jesus and Paul preached the same gospel. Because they both announced the good news that God’s kingdom — his rule on earth, his blessing, everything that we lost in Genesis 3-11 — was being restored in and through Jesus the King! Notice that the first time the gospel is mentioned in the New Testament, it is most decidedly not “Jesus died for your sins.” Rather, we’re told that Jesus went about “preaching the good news of the kingdom” (Matthew 9:35). Mark’s Gospel says that Jesus proclaimed “the good news of God: ‘The time is fulfilled, and the kingdom of God has come near. Repent and believe the good news!’” (Mark 1:14-15). In other words, Jesus was announcing that the reign of God was being restored to this fallen world. All the promises God had made to Israel in the Old Testament — especially his promise to provide an heir to King David who would unite all humanity and restore God’s blessing to earth — were about to be fulfilled. And through the things Jesus did — performing miracles by the Spirit of God; forgiving people’s sins; casting out the powers of darkness; gathering a community of followers; interpreting God’s law for a new age — Jesus made absolutely clear that he was the promised King of that kingdom! In his presence, the kingdom was present. Good news! But to bring in that kingdom, Jesus had to offer himself as the sacrifice that would initiate the new covenant (see Mark 14:24-25). He had to fulfill the prophecies that the Servant of the Lord would suffer for the sins of his people (see Isaiah 52:13-53:12). He had to do away with the curse that the Law of Moses proclaimed on disobedient Israel so that blessing could come to all nations (see Deuteronomy 28-30; Galatians 3:10-14). In other words, Jesus had to die for our sins on the cross so that the kingdom could come. And he had to rise again to prove he was indeed the Son of God, the promised King — i.e., so he could reign. So that it would in fact be good news. The gospel is the story of how Jesus became the saving King. And this is what the apostle Paul preached, as well. A lot of people question why Jesus doesn’t seem to have taught the “gospel of justification by faith” that Paul preached, but that only proves they haven’t really understood the gospel Paul actually preached. Because it’s the same good news, and it’s all about Jesus. Jesus is King. The gospel is the good news that Jesus has begun to reign. It’s also the story of how he has taken care of our sins through his death and resurrection, and of how he is now reigning from heaven and bringing about his kingdom in and through the church. And it’s also the promise that one day he is going to return physically to finish what he started and complete his reign here on earth, resurrecting his people from death and renewing the whole cosmos! If we look at the gospel in this way, as this bigger story of Jesus’ present and future reign, how might that change how we think about things like faith, repentance, salvation, and the Christian life? How should it affect what we say is the proper response to the gospel? Wouldn’t this focus on Jesus’ kingship help us make sense of why Jesus can call us to not only believe in who he is (John 6:29) but also obey what he commands (Matthew 7:21-27)? A gospel centered on Jesus’ kingship unites the biblical threads of faith, faithfulness, and the life of discipleship we are called to. Now more than ever, the church needs to recover the gospel the New Testament teaches. The gospel that Jesus, Paul, and the other apostles preached. The gospel that not only gives us hope and new life, but also summons us to take up our crosses and follow our crucified, resurrected, ascended, and coming King. 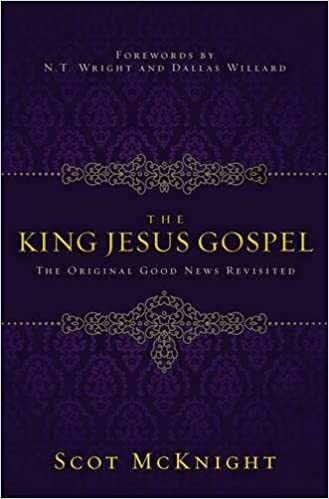 Check out Scot McKnight’s book, The King Jesus Gospel: The Original Good News Revisited. ‹ What Are Spiritual Gifts, and How Do I Discover Mine? Tags: Jesus and Paul, justification, Kingdom of God, Scot McKnight, summary of the gospel, the gospel, The King Jesus Gospel, what is the gospel? McKnight does a good job of placing the weight of the gospel on its political-social ramifications—as does Paul toward the end of 1 Cor 15 (all powers must be put under Christ’s feet) and John in Revelation 14:6-20, which is perhaps the gospel-text least integrated into evangelical theology (the gospel as judgement of ever nation and people). But McKnight divests these texts of their prophetic significance by supposing that their political expectations are still in our future—when in fact the NT authors anticipated massive political transformations “soon,” and even within their lifetimes. Alex, thanks for reading. It’s true that the social ramifications of the gospel were incredibly significant for the NT authors (and that significance is ongoing). Not sure I’m tracking with your last point. If the full consummation of the kingdom was viewed as future-but-imminent for the NT authors, I don’t see how it “divests the texts of their prophetic significance” to hold to a still-future-and-always-imminent consummation today, and to continue to call all nations to repentance and allegiance to Jesus. Thoughts? Holding to a still-future-and-always-imminent consumation is one response to the delay of the parousia. But I think then we have to conclude that the NT writers were wrong to think the kingdom would come very soon. They weren’t putting their hopes in a kingdom coming in the distant and indefinite future. They were putting their hopes in the salvation wrought by a king and kingdom that was about to emerge. So a better response in my view is to return to the history-centric Jewish roots of NT apocalypticism as we think about the parousia and kingdom; an apocalypticism not directed towards the end of the world/time but directed toward major transformations within history itself–the end of one age and the beginning of another. If in the NT the kingdom and the parousia primarily concern judgement for evildoers and security and exaltation for the faithful, the collapse of paganism and the conversion of the Roman empire, that is, the conversion of the known world, was just such an earth-shattering turn of events. The persecuted churches were vindicated and the emperor himself confessed Christ as Lord. The fall and replacement of this Babylon (Greco-Roman paganism) better corresponds with the NT’s imminent apocaltypic frame as well. Gotcha. Thanks for clarifying. I think there is a lot of truth to that. Personally I’m still convinced that there is also an emphasis on the far future/end of the world in Jewish apocalyptic, and that it often blurs together with imminent political expectations. So I take a both/and approach, not an either/or. Especially for topics like the resurrection from the dead (which Paul expected to be literal/bodily and to spell the end of all physical death, as 1 Cor 15 teaches) and Jesus’ actual, physical return to earth (Acts 1:11), I’d say we still have to hold to a future fulfillment as well. So I’m more in the camp of the eclectic approaches to eschatology than to the strictly historicized/preterist views. Anyway, that’s my take. Thanks for sharing your thoughts! A lot to think about. I understand. The kingdom of God and the new creation tend to blur together. But I do think they can and should be effectively distinguished as Andrew Perriman makes the case for here: https://www.postost.net/2008/02/new-creation-kingdom-god. The kingdom subplot, as opposed to the book-ending creation narrative (Genesis 1-3, Revelation 21), addresses the long problem of God’s people living among godless empire (spanning the call of Abraham out of Babel to the erection of the kingdom over the nations once dominated by ‘Babylon’). The book of Revelation mostly concerns this political-historical narrative in which Babylon falls, the son of man judges every nation and people, “the kingdom of the world becomes the kingdom of God,” and Christ rules over the nations for a thousand years. New creation, the physical resurrection of the dead, and the final judgement then occur on the other side of the kingdom (still in our future). The figurative coming of the Son of Man from heaven, I think, is part of the Kingdom-Babylon subplot rather than the finalizing new creation narrative. The son of man comes to judge the beasts of pagan empire and grant to his servants a righteous kingdom in its place which will rule the nations and teach them God’s ways. But you may be right that someone like Paul believed this all would occur at essentially the same moment: the resurrection of the dead, the establishment of the kingdom, and the end of history. Still, 1 Cor 15:24-28 suggests to me that the kingdom will exist for some time before the consummation of all things and the defeat of death. Paul may not have an envisioned a thousand year reign prior to the resurrection but he at least recognized a correct chronological ordering of things: https://www.postost.net/2018/05/resurrection-just-unjust-daniel-horizons-eschatology. Very interesting perspective. I’ll be sure and check out Perriman’s articles. Seems like a more nuanced position than most preterist arguments I’ve seen, so I’m intrigued.